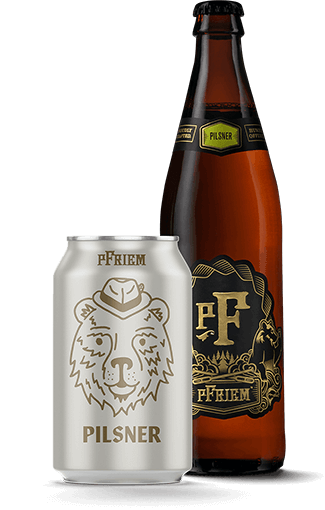 Sweet meets savory with pFriem Rauch Helles. It’s a brilliant golden beer with aromas of smoked beachwood, toasted biscuit, fresh bread, and earth. Woodfired notes of charred peach and cinnamon raisin bread finish with a kiss of malt, and a savory, sweet smile. When the golden and clean lagers of Plzen (Bohemia) became all the rage in the mid-1800's, München brewers feared that Germans would start drinking the Czech beer vs. their own. Munich Helles Lager was their answer to meet the demand. A bit maltier, they often share the same spicy hop characters of Czech Pils, but are a bit more subdued and in balance with malts. "Helles" is German for "bright." This Helles is an homage to the Rauch (smoked) beers from the Northern Bavarian region of Franconia where smoked beers are king. The malt is smoked during the kilning process which mimics the traditional direct fire kilning of the past. Rauch Helles showcases a robust and bright Helles lager with rich and intriguing smoke notes. The smoke is light and balanced but keeps the palate yearning for more. Brilliant golden straw body topped with whipped white foam. Tantalizing aromas of smoked beach wood, toasted biscuit, fresh bread, and earth. Wood fired flavors of charred peach, cinnamon raisin bread, and biscuit malt. Sweet and savory finish lifted by sparkly carbonation with a kiss of malt. Rauch Helles is great with sandwiches or pressed Panini. Goes well with delicate fish- sole, plaice, flounder, and turbot. Delightful with shellfish: clams, crab, and scallops. Excellent with Sushi. Light pasta dishes work well with oil based or creamed sauces.